Melted chocolate can turn average snacks like pretzels and strawberries into sinful treats. You can melt chocolate by itself, but adding a bit of fat helps it melt more smoothly and lends a softer consistency once the chocolate sets. Choose a fat that tastes neutral to keep the integrity of the chocolate's flavor. Vegetable and canola oil are both good choices. Place the chocolate chips in a microwave-safe glass bowl. 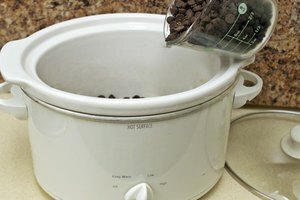 Add no more than 1 tablespoon vegetable oil for every 12 ounces of chocolate chips. Thoroughly mix the oil in until the chocolate chips have a sheen and the oil is no longer visible. Microwave the chips on high for 10 seconds at a time. The power of the microwave determines how long it takes to melt the chocolate chips. If you have a low-wattage microwave, you may want to start out with 30 seconds and then decrease to 10- or 15-second intervals. Stir the chocolate after each heating until fully melted. This is important because otherwise some of it will scorch while the rest remains solid; it also helps the chocolate melt faster. 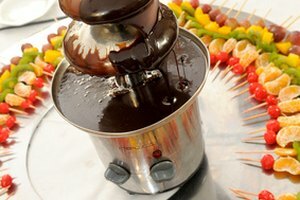 How Much Oil Should One Use in a Chocolate Fountain?